Package Include: 1 pcs christmas tree skirt. 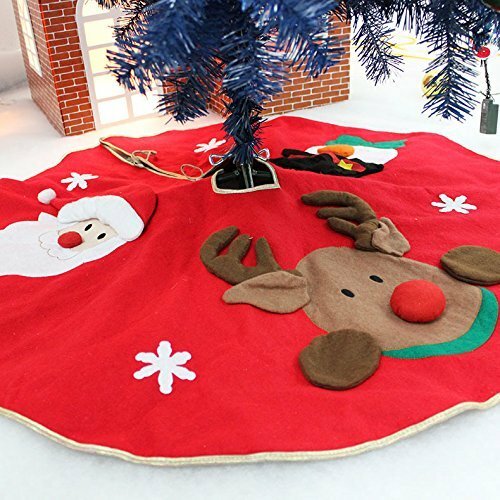 HIGH QUALITY MATERIAL: This Christmas tree skirt is made of Excellent Non-Woven material. Very attractive,sturdy and durable.Perfect for keeping your home or office's floors clean from fallen pine needles and ornaments all throughout the holiday season. DISTINCTIVE DESIGN: This Christmas tree skirt features a delicate white snowflake,santa,snowman and reindeer pattern,Used for decoration while hiding unattractive tree stands,make your christmas tree more charming. PERFECT FOR ANY TREE: Measuring 42 inches in diameter, this tree skirt is perfect for any size tree from small to very large trees.Decorate your tree to look good with this beautiful tree skirt. If you have any questions about this product by KPAO, contact us by completing and submitting the form below. If you are looking for a specif part number, please include it with your message.